Tyson and I have been overwhelmed by the constant love and support and we have received from you all. You continue to lift us up with your extreme generosity and kind, beautiful words of encouragement. Tyson was ALL smiles when I sat him up in February to show him the hundreds of #showtysonyourkicks photos. I can tell you firsthand how isolating and depressing it can be to be in this fight and you can take that and multiply it by 100 to get a sense of how Tyson feels from time to time. These messages, photos, texts all mean so much to him, making him (and the boys and myself) feel connected with you all and loved immensely. Your donations help fund his physical therapy sessions and cover any medicines, appointments, or supplies that are not covered by our plans. We hear you cheering loud and clear and we THANK YOU! So overall, the past three months have been pleasant. 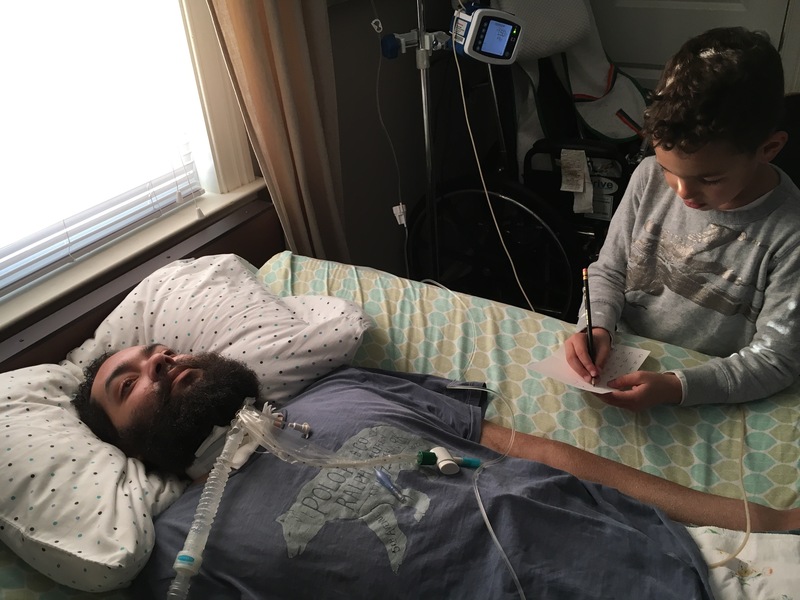 Despite being on bed rest still while his pressure sore is in the final stages of healing, he has been able to continue to work hard in his physical therapy sessions twice a week with Mike. As you know by now, these sessions are incredibly crucial. Mike is still getting a return from each muscle he works with and in most cases, those muscles are getting stronger. Tyson’s at a slight disadvantage being in bed because the mattress makes it difficult to activate certain muscles the way that we want to but even still, progress is being made. We do “edge of bed sitting” for the second half of each session which is excellent for so many reasons: It helps to strengthen his core because he’s forced to engage those muscles, it’s also great for his neck muscles, although I kneel on the bed behind him and support him, there are moments where he works on holding his head up by himself, it’s great for his diaphragm and lungs because of the decreased physical pressure and the increased blood flow and lastly, it’s SO good for his eyes, jaw and facial muscles. Because he’s been lying flat for a big chunk of time, his muscles have weakened in his face and his jaw has tightened and retracted slightly. By sitting up, Mike is able to work on the TMJ muscles and actually get his thumb into Tyson’s mouth and open it up slightly. The jaw work is incredibly painful for Tyson but obviously extremely necessary. 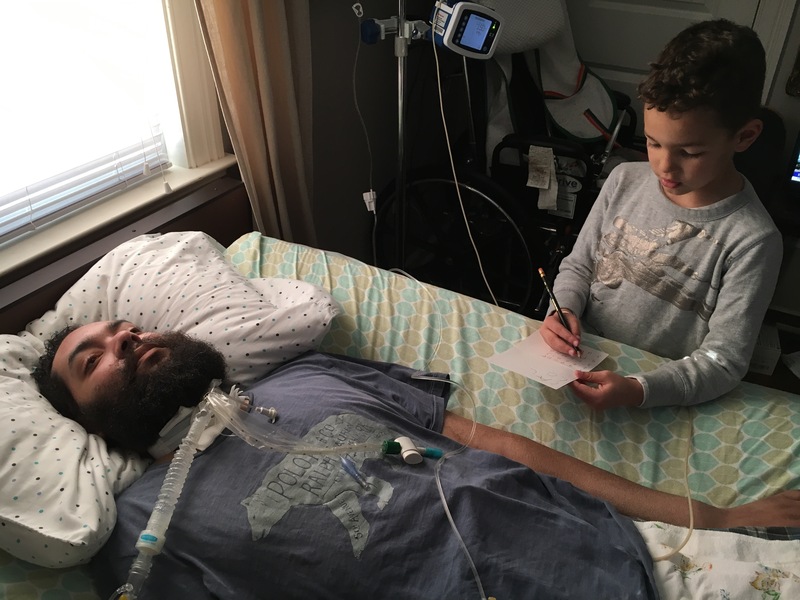 All of this therapy is preventing Tyson from getting pneumonia and being hospitalized as well, which can be devastating for someone in Tyson’s condition. We are anxious to get him sitting up full time and able to spend time in his wheelchair but we are happy with how he’s doing at the moment. We are taking a break from antibiotics for a little while to give his body a break. 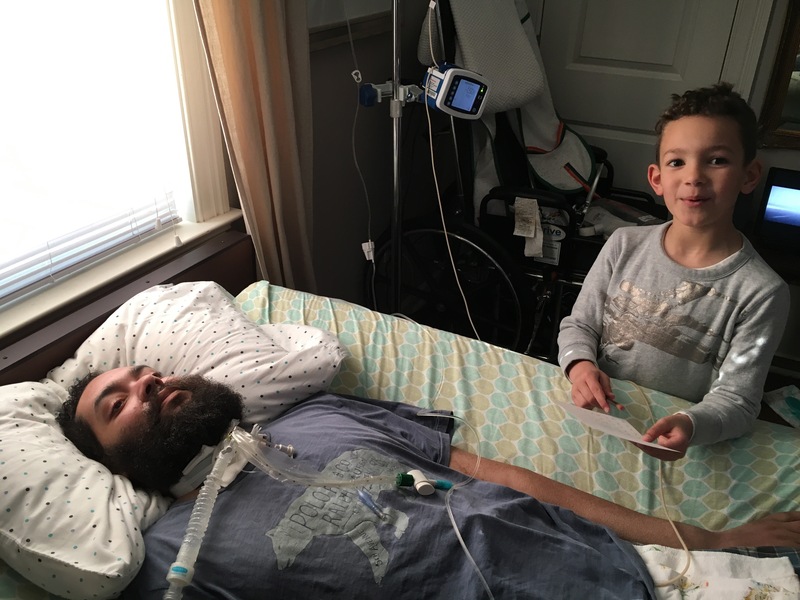 Antibiotics are critical for this fight but while they work to attack the bad bacteria, they’re also going after the good bacteria in his body which can be incredibly taxing on his system. In June, we will discuss with Dr. Horowitz the possibility of reintroducing some of the antibiotics, but for now we will focus on letting his body take a break. The boys are both doing very well. I love the way the love their daddy SO much. It’s very sweet and special to watch them interact. They’re gentle, patient, and so full of love for their dad and it makes him smile. ❤️ Calvin has been learning to read and write in Kindergarten. One day last month when he got off the school bus in the afternoon, I had an idea. 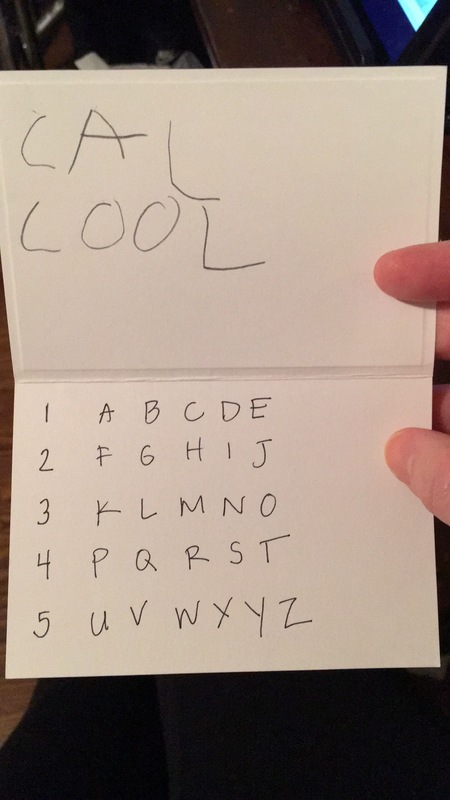 I’m constantly looking for ways for the boys to connect with Tyson, so I made Cal a little letter chart (just like mine) and taught him how to use it so he could speak with Tyson. Tyson had a couple words picked out for him to spell, and so Cal went through the chart with Tyson’s direction (raising his eyebrows when Calvin landed on the correct letter) and spelled out two words. We were all laughing and Calvin was actually squealing with excitement. He was also pretty proud to be able to put what he had learned at school to practice. As many of you know, I was able to attend the Global Lyme Alliance gala on April 1st here in Greenwich. I was extremely honored to be there representing our family and to be around such wonderful people. This incredible organization is dedicated to finding a cure and an accurate test for Lyme disease as well as educating physicians and the public about the dangers of Lyme. 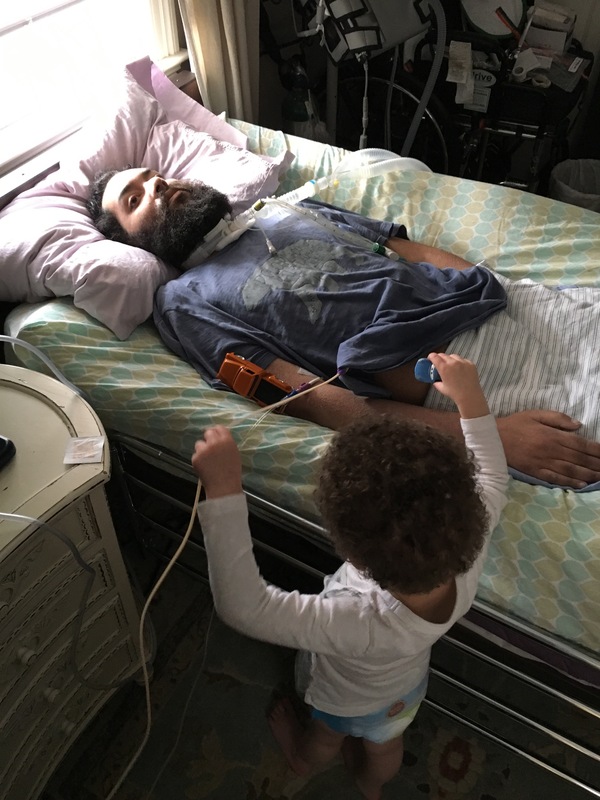 For those who don’t know Tyson’s story, he was tested five times for Lyme disease over the course of a year that was already filled with a battery of other tests and empirical treatments. 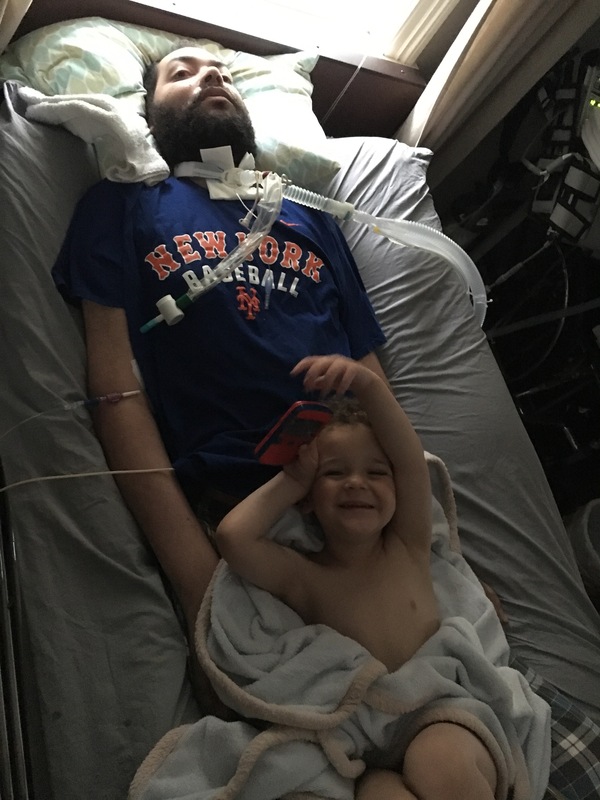 Each test came back negative or inconclusive which forced us to continue on our wild goose chase searching for answers all while the bacteria was making its way into his motor neurons, causing his body to quickly shut down. Without a shadow of a doubt, had Tyson been given an accurate test and the Lyme had been discovered within the first few months after his first set of symptoms, a month’s worth of antibiotics could have prevented the nightmare that ultimately lied ahead for us. May is Lyme Disease Awareness month and we encourage all of our friends and family to visit their website http://www.globallymealliance.org as well as http://www.ilads.org to educate yourselves about this disease that has become a pandemic. These two sites are the most comprehensive when it comes to learning about Lyme, what to do if you’ve been bitten, and how to find a LLMD (Lyme literate doctor). One thing is for sure, Lyme disease does not discriminate and I f we had known 10 years ago a fraction of what we know now, I believe Tyson would be in much better condition. Tyson’s doctors and I are still working on getting this treatment that I mentioned in February approved by the FDA. Despite the countless roadblocks and “red tape” we are encountering, we remain persistent and confident that we will soon get the approval so that he can begin treatment. Please keep it in your prayers that we get the approval soon! I am doing well. I’ve lately had my own health issues that needed to be addressed and so I’ve made sure to take them seriously because I know I’ve got to be healthy in order to care for my boys, big and small 😉 Life is without question, difficult for us but we are all so adjusted to it at this point, it’s like we are on auto-pilot. I am so confident in Tyson’s recovery because I know where we’ve been and what we’re capable of. He in in the middle of a monumental recovery process that will require so much love, hard work, and support and I know he will be triumphant. He looks very healthy and very focused on getting himself BACK. Thank you all so much and hopefully I will be able to update you soon with some good news regarding his treatment. Happy Birthday Tyson!! Praying for approval!! Praying you continue to remain strong praying for your boys praying for your incredible wife to remain strong and diligent as she has always been!! Praying for you!!! God continue to bless this family. Amen. Happy Birthday Tyson!! And many more! Have been praying to God for you and I won’t stop.